Again We Have To Fight For The Right To Ride. Best Photos of 2011 Is Presented. For 2017, the Unicycling Society of America has established and announced the fourth week of the month of May as National Unicycle Week. This year May 21st - May 27th, everyone who rides unicycle is encouraged to step up and share their love of unicycling. Be more of ambassador to the sport of unicycling this week by helping new riders learn and improve their skills and encouraging people to try unicycling. Our sport has evolved and grown tremendously over the last fifteen years. Many of us have done our part to make unicycling more common in our own communities. I invite you all to do a little extra during National Unicycle Week to promote our sport and entice others to join in the fun. 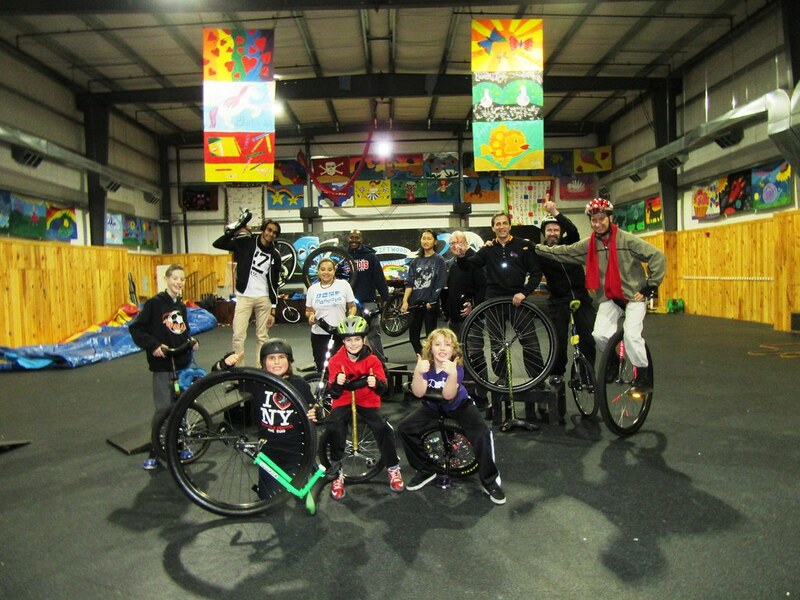 For the fifth consecutive year, New York Unicycle club members have been invited to visit by Adam and Renie Cohen to visit the Just One Wheel balance facilities. This, as in the previous two years we visited them on the campus of the Driftwood Day camp. As you may remember, the last two years we experienced really rough winters that were really cold with a lot of snow. This year's Winter we thankfully had milder temperatures and no snow on the ground. So this year we took advantage and did some riding both indoors and out. Yes it did snow that afternoon. However, in the early afternoon with just a dusting of snow on the ground a bunch of us ventured outdoors to ride around the campus. We had a great time. I would like to again thank Adam, Renie and the Balance Brothers, Ziggy and Ikey for inviting us out to spend the afternoon with them. We have had a pretty incredible unicycle season this year. There have been many well attended meetings and events. The 2012 NYC Unicycle Festival was quite a success. Our sport continues to grow in popularity and to advance technically. We have just about a full year of photographs on our NYUC Flickr site. There was an amazing amount of participation at this year's festival. Click on the above photo to see a slideshow of the few photos that I took at this year's three day festival. We had more than 160 unicyclist cross the Brooklyn Bridge on Brooklyn Unicycle day. The two days on Governors Island were well attended with so much going one it was hard to take it all in. This year I was really trying to enjoy the festival instead of taking a lot of photos. I guess I will just have to do better job at taking photos and event reporting next year. Keep riding and advocating for our sport. 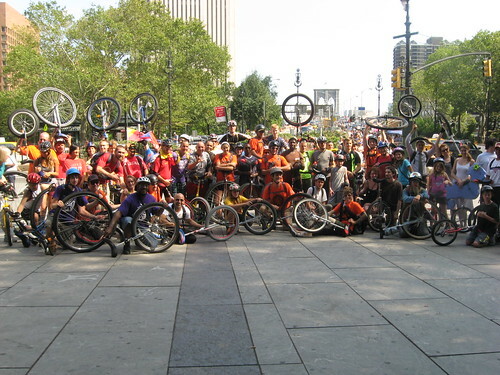 The third annual NYC unicycle festival will be taking place from Friday, August 31st through Sunday, September 2nd. I hope that you all are ready for some fun unicycling activities. As in the past, this year's three day unicycle festival is being organized and produced by the Bindlestiff Family Cirkus. Participation in all events are free of charge. 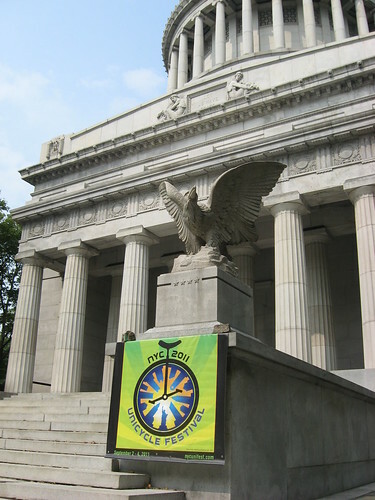 We are asking everyone to support the event anyway that you can by either volunteering or contributing through the NYC Unicycle Festival website. You can also contribute at the event by participating in the the daily raffles and purchasing T-shirts and other memorabilia. Sponsors are also welcome. The organizers have published the following schedule of events, some of which are subject to change. We will post additional information as it is made available to us. Bringing or having your own unicycle is not required for participation in many of the activities. A helmet will be required for participation on the trials course as well as new learner in the workshops. It is optional but recommended for other unicycling activities. Be sure to register for the festival upon arriving in the activities area on Governor Island. Friday, August 31st Brooklyn Unicycle Day - times are approximate. If you are meeting up for a portion of the ride, it is advisable to get to meet up locations 45-60 minutes prior to scheduled time. Any and all unicyclists with any size unicycle are encouraged to join in the ride over the Brooklyn Bridge. However it is recommended that a 24 inch wheel or larger be utilized for the ride through Brooklyn on to Coney Island. 2 pm Riders gather on the East Side of City Hall Park (on Park Row, Manhattan)) 3 pm Cross Brooklyn Bridge (all wheel sizes are encouraged) 4 pm Pass through Grand Army Plaza into Prospect Park. 5 pm Enter the Ocean Parkway Bicycle Path 6 pm Arrive at Coney Island (arrival time is approximate) 7 pm Dinner break. Buy your own food and meet by Nathan's Famous (Stillwell & Surf) 8 pm Meet at Deno's Wonder Wheel for the Coney Island Unicycle Jam 9:30 pm Fireworks Saturday, September 1st Governors Island Noon to 4:30 pm Learn to Ride Noon to 4 pm Trials Course Noon to 4:30 Open Riding 1 pm Workshop: Hopping by Jim Owen 2 pm Basketball 3 pm Record Setting Attempts 3:30 pm Races 3:55 Group Photo 4 pm Trials Course Show Off 4:30 One-Wheel Public Show 4:55 Raffle Drawing Sunday, September 2nd Governors Island Noon to 4:30 pm Learn to Ride Noon to 4 pm Trials Course Noon to 4:30 Open Riding 1 pm Workshop: Unicycle mounting by James Sui 1:30 Workshop: Wheel walking by Logan Kerr 2 pm Hockey 3-4 Relays and Games 3:30 Sumo Wrestling 4 pm Trials Course Show Off 4:30 One-Wheel Public Show 4:55 Raffle Drawing I hope that many of you will be participating in on multiple days. Isaih Rosmond is pictured above showing the summons that he received from a NYPD police officer for riding his unicycle on the sidewalk on his way to school in Brooklyn. Upon being stopped by the police Isaih pull out his smart phone and looked up the necessary information to prove that it is not illegal to ride a unicycle on the the sidewalk. The police officer ignored him and continued to write and issue the summons. In this article in the Courrier Life Brooklyn Daily, Kyle Petersen, The Brooklyn Juggler is chronicled as having reached out to Isiah to offer advice based upon his own experience in having to fight multiple violations issued by the NYPD. If you are unfamiliar with Kyles cases, check my previous postings regarding his summons and lawsuit against the City of New York. My advice is to immediately let the officer know that there is no law in the state that mentions or even describes a unicycle. For the 2011 unicycle year I have chosen over 130 photographs taken at unicycle club meetings and other unicycling events. This year I am featuring The Brooklyn Juggler, Kyle Petersen. 2011 had been quite a year for Kyle. From his law suit against the city of New York, to appearing on the David Letterman and Colbert Report television shows, to entertaining us with his Unicycle Action News reports posted on Facebook and YouTube. 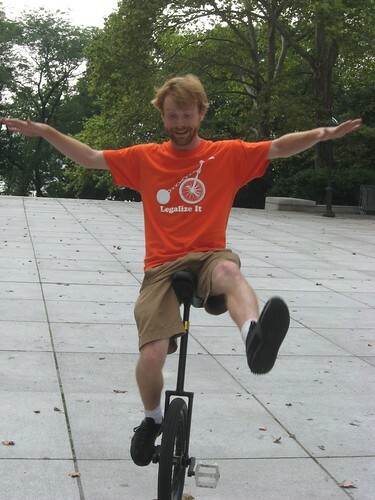 Kyle Petersen has brought much positive attention to the sport of unicycling and to the New York Unicycle club. I also have to highlight Ziggy Cohen, who also has had an incredible year of 2011 unicycling. 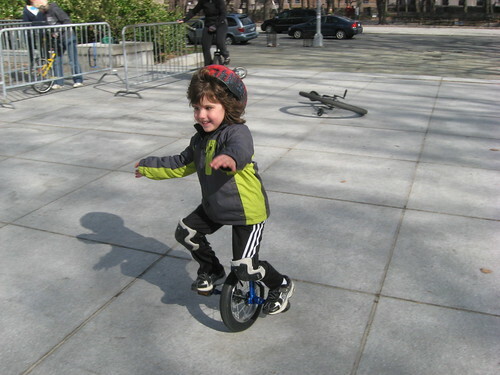 At four years of age he is one of the youngest unicycle riders ever. He appeared in video that has been broadcast locally as featured on Long Island's TV55 and also nationally including the Cobert Report and the Wendy Williams show. His mom and dad, Adam and Renie, have recently opened the first of it's kind facility called Just One Wheel. If you were not aware, take a look at my earlier post about the new Just One Wheel facility a business that is dedicated to the sport of balance. Take the time to look at the slideshow of the Best of 2011 photos on our Flickr.com photostream. On December 4th, early Sunday morning, CBS News aired a segment by correspondent Susan Spencer documenting on video, her attempt to learn to ride a unicycle. She enlisted the assistance of Lisa Polinari alias The Unicycle Lady to aide in her endeavor to learn the basics of learning to ride. Check i t out. The New York Unicycle encourages and assists individuals to learn how to ride unicycle regardless of age or gender. The diversity of those that have over the year attended our meetings in terms of age, gender nationality, ethnicity and cultural background is astounding. Meeting twice per month all year round, you have ample opportunity to come out and learn to ride. For more than 40 years the King Charles Troupe has been successfully performing on unicycles for audiences throughout the globe. There is a video currently being put together documenting their 44 year history. The video will illustrate the King Charles Troupe's journey from their humble beginnings in the borough of the Bronx, New York City to their travels throughout the United States as well as 14 countries throughout the world. They have truly been global ambassadors for unicycling that have inspired several generations to learn to ride the unicycle. Check out the documentary trailer. A new up coming video soon to be release on DVD called Unicycling is not a crime features 36 different unicycle riders of 12 nationalities. Parts of this video was recorded in 1o different countries. Two NYUC members can be spotted at the beginning of this video trailer. The second annual three day New York City Unicycle Festival took place over the Labor Day weekend. This years festival organized and produced by by the Bindlestiff Family Cirkus turned out to be a well attended success. The festival began with a contingent of 57 unicyclist with unicycles of various sizes and colors, including one made up to look like a sea horse, making the trek over the Brooklyn Bridge. The day was officially proclaimed by Brooklyn's Borough President, Marty Markowitz as "Brooklyn Unicycle Day". 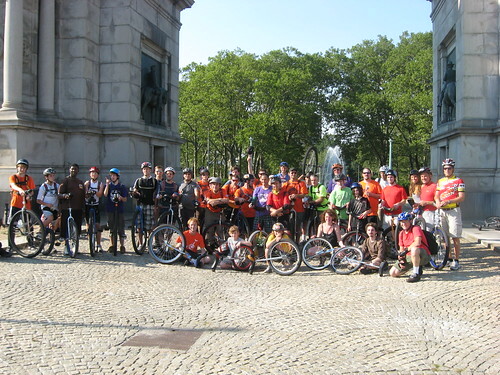 About 40 or so riders continued on riding through Brooklyn briefly stopping at Grand Army Plaza and the south end of Prospect Park finally ending up in Coney Island where we met up with participants that decided to get there via other forms of transportation. We had two adventurous 11 year old riders that traveled the entire 13 mile distance from the Manhattan side of the bridge to Coney Island on their unicycles. These two young men actually out paced many of the more experienced unicyclist throughout the ride. Many of the out paced rides were riding on wheels larger than the 20" and 24" size wheels on their respective unicycles of the young riders. [caption id="attachment_1551" align="aligncenter" width="346" caption="Photo courtesy of Norman Blake"] [/caption] At Coney Island after hanging out at Nathan's Famous, riders were rewarded with a ride on Deno's Wonder Wheel followed by participation in a unicycle skills demonstration being accompanied by music on the boardwalk. The first day of the unicycle festival was capped off with an incredible fireworks display out over the water. Day two of the festival that took place on Governors Island, was chock full of activities. With unicycle tutorials, unicycle hockey, unicycle races and, skill demonstrations there was constant activity throughout the festival area of the island the entire day. Many tried out the outstanding Hell on Wheel unicycle trials course. The demonstrations featured four year old unicycle rider Ziggy Cohen as well as Kyle Petersen (Brooklyn Juggler) and Davd Cox performing comedic juggling acts. 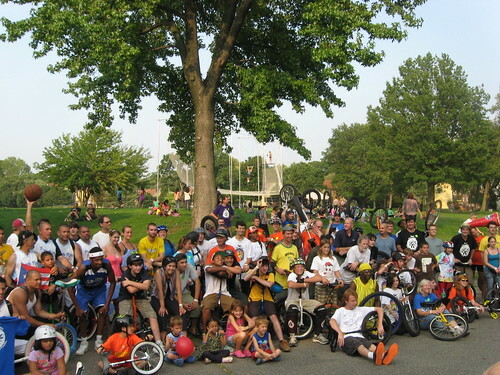 Through out the day there were more than 300 participants with more than 160 unicycles. There were vendors on hand including Unicycle.com and Dubé Juggling Equipment and others. Adam and Renie Cohen of Just One Wheel were directing the tutorial efforts for those that wanted to learn or hone their skills on the unicycle. DJ Sky kept the crowd entertained with music selections throughout the day. The highlight of the day was the unicycle basketball game between Puerto Rico All Star unicycle basketball team and the King Charles Troupe. It was a competitive, hard fought basketball game. King Charles Troupe trailed early. However, as they adjusted to the international rules of unicycle basketball, they climbed back in the game only to be edged out in the end by the Puerto Rico All Stars by a single point 37-36. The King Charles Troupe put on excellent performance of unicycle team based skills such as basketball handling and jumping double dutch. All available unicyclist lined up and mounted their unicycles in an effort to break a world record of unicyclist mounted and continuously linked. Unfortunately there were not enough participants present to break the world record of 251 unicyclist. Though, this effort was not wasted by the 155 participating unicyclist who set a new New York State record of linked unicyclist. For the third and final day of this year's festival unicycle activities moved up to Harlem, USA. This is the regular meeting venue of the New York Unicycle club. About 65 unicyclist gathered for a full afternoon of just hanging out trying different and unique unicycles, doing skill demonstrations, practicing skills and unicycle networking. Throughout the three days I snapped a nice collection of photographs that can be found on the NYUC Flickr site. Photographs of days one and two can be viewed in this photo album slideshow titled: 2011 Uni Fest, Day 1&2. Photographs from the third and final day of the festival can be found in this photo album slideshow titled 2011 UniFest Sunday. This years festival was such a blast. There is a lot of confidence that this event will continue to grow in the future. There were many who were unable make it to this year's event including many that had attended the first NYC unicycle festival.